Dr. Christine Wu always appreciates feedback from her valued patients. To date, we’re thrilled to have collected 136 reviews with an average rating of 4.8 out of 5 stars. 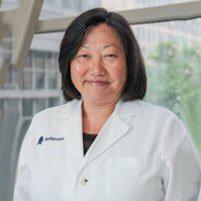 Please read what others are saying about Dr. Christine Wu below, and as always, we would love to collect your feedback. Both Dr Wu and her staff are wonderful. Dr. Wu always takes time to discuss what has been going on since last visit and answer any questions. Dr. Wu is thoroughly professional,knowledgeable and excellent doctor. She always allows you to ask any questions you may have and makes you feel very comfortable. Her staff are very friendly and accommodating. I highly recommend Dr. Wu!! Dr Wu is not only a through professional, she is a kind and caring person. I have a very high degree of confidence in her care and knowledge. Dr. Wu is the best! Had my yearly checkup with Dr Wu today. It was a great visit with no wait time. Everyone involved with my care was pleasant, curtesy, and helpful. They got me in and out in no time. And we’re very thorough. Dr Wu gives you a100% of her attention when caring for you. Dr Wu is friendly, professional, knowledgeable and never in a rush. I would highly recommend her. It's always a pleasure to see Dr. Wu. She's pleasant & even if I'm a little anxious, she quickly calms me down. Bedside manner is important to me & she is at the top of my list. Dr wu and staff are awesome.I always have a positive experience at her office. Dr. Wu is simply the best, she never makes you feel uncomfortable and never rushes you through your appointment! Thank you!!! Terrific staff, seen on time. Great care. Dr. Wu’s new office has many thoughtful touches: cloth gowns, oven mitts on the stirrups, a soft blanket if you get chilly and a chair conveniently placed within reach of the exam table- in case you need to reach for something in your handbag. Bill’s handling of records, appointments, prescriptions and all other matters is a symphony of accuracy and attention to detail. The technician is welcoming and highly skilled at her job. I am not, however, sure what the function is of the non-verbal young woman who sits at the reception desk. I have been a patient of Dr. Wu for over 30 years. She has guided me through all phases of my reproductive life with professionalism, intelligence and kindness. I trust her implicitly. Love Dr Wu!!! Been going to her for about 15 years. She's smart, caring and I informative. She makes me feel secure in her care. Dr.Wu is an excellent doctor and has a pleasant manner as well.